Andrew Phillip Chambers, Jr. was a retired Lieutenant General in the United States Army. His brother Lawrence Chambers was a Rear Admiral in the United States Navy and together the Chambers brothers are the first black siblings to hold flag ranks together in the United States military. Andrew P. Chambers, Jr. was born on June 30, 1931 in Bedford, Virginia, a small town near Lynchburg. His parents were Charlotte Hadessa Chambers and Lawrence Everett Chambers. Andrew, who sometimes went by Andy, had four other siblings and the entire family moved from Virginia to Washington, D.C. after the death of Andrew’s father so his mother could work for the War Department in order to support her young family. The moved allowed Chambers to receive a quality education. He attended Paul Laurence Dunbar High School in Washington D.C., which was at the time a segregated institution but was unique as its teachers had equal pay with instructors in white schools, thus attracting well-educated and qualified faculty. At Dunbar High, Chambers earned an Army ROTC scholarship which allowed him to enroll at Howard University. During his time at Howard, Chambers met Norita Elizabeth Garner. The two married on May 8, 1954 and eventually have five children together. 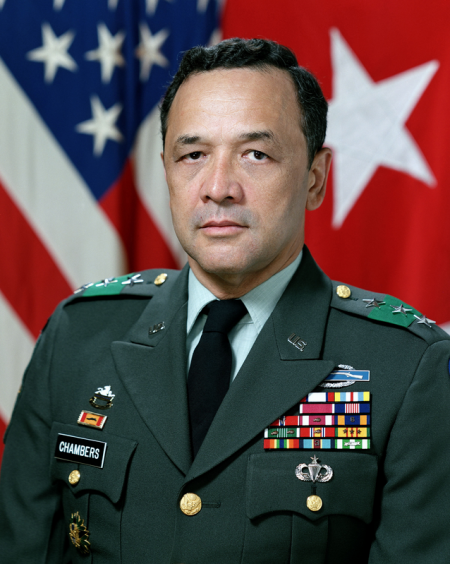 Chambers also graduated from Howard University in 1954 and was commissioned as a Second Lieutenant in the United States Army, which begun his 35-year career in active military duty. Chambers served in numerous post throughout his career. He was Director of the US Army’s Equal OpportunityProgram in the 1970s and commanded the VII Corps of the U.S. Army (approximately 45,000 men and women) starting 1985. The VII Corps was one of two principal corps in the United States Army Europe during the Cold War and comprised half the American troops stationed on that continent at the time. From 1987 to 1989, he served as the Third U.S. Army Commanding General and Forces Command Deputy Commanding General at Fort McPherson, Georgia. While serving in this position in 1988, Chambers received the Black Military History Institute Atlanta Chapter’s “Buffalo Soldier Award” for his distinguished military service. This was his last active duty post as Chambers officially retired from military service in 1989. Chambers later had a successful career as the director of community service for AmeriCorps and then as vice president of the University of Maryland University College campus in Europe in Kaiserslautern, Germany. Lt. General Andrew Chambers died on June 3, 2017 at the age of 85. He was buried at Arlington National Cemetery in Virginia with full honors. Preceded by his parents and his sister Charlotte Walker, Andrew Chambers is survived by his wife Norita, their children, grand-children and great-grand-children as well as Chambers’ remaining three siblings. AUSA Staff, “Lt. Gen. Andrew Chambers, Former AUSA Director, Dies,” Association of the United States Army, July 28, 2017, https://www.ausa.org/articles/ltg-chambers-dies; “Obituary of Lieutenant General (Retired) Andrew Chambers,” Adams Green Funeral Home, http://adamsgreen.com/tribute/details/4333/Lieutenant-General-Retired-Andrew-Chambers/obituary.html; USARCENT PAO, “Lt. Gen. (retired) Andrew P. Chambers,” Army Central, 12 June, 2017, http://www.usarcent.army.mil/News/Features/Article/1211086/lt-gen-retired-andrew-p-chambers/.